With an attractive design and long battery life, this looks like a decent buy, but does the quality of the build justify the price of the device? The Go activity tracker is light weight making it comfortable to wear. The screen is great and allows for the possibility of a multi-month Battery Life. The quality of the wrist strap makes the device look worn out after only a few months of usage. The quality of the electronic puck can easily create skin irritation after the first battery change. While the device looks like an attractive option up-front, several months of wear has revealed that the Build Quality, and its effect on the durability of the device, do not make the Go a great Value. The feature set and functionality of the Go would seem to make the purchase an easy decision. Unfortunately, the few negatives undo the positives. The lack of Windows Compatibility means that not everyone will be able to use it, and some issues with the Design make it look like a bargain product. The real issues, though, stem from the issues with the Build Quality which lead to issues with Comfort. With an MSRP of $79, the price is at least $30 too high for the overall quality of the device. The Withings Go has both a unique and useful design. The most notable aspect of the wearable's design is its screen. Rather than using an LCD screen, like many others on the market, the Go uses an E Ink technology, which provides a number of benefits. Operationally, the most important benefit is readability: E Ink can be easily read in just about any light. For daily convenience, however, E Ink means that the device has great Battery Life. Another unique aspect of the Go is the various ways it can be worn. The traditional wear is, of course, on the wrist. From there it can detect steps and sleep patterns. It can also be worn like a traditional pedometer, on the hip, where it can detect just steps. This is made possible by the fact that all of the electronics are included in a small coin-sized piece that snaps into these differing pieces. The device has two states, both of which fit relatively well. While in pedometer mode, the clasp is tight enough to not worry about losing it. Whether walking or running, you can be assured that the device is not going to release and get lost. While in watch mode, the experience is very similar. The only difference is, because of the design of the clips, there are scenarios in which you might not get a perfect fit. If your wrist is halfway between two notches, it might be too loose, with no obvious solution. Luckily, the spacing between notches is not so great as to ruin the experience. Bluetooth low energy works differently from traditional Bluetooth. Your device must support this newer technology, and you must register the device through the accompanying app. The process of pairing was direct and easy and is explained in detail under Setup. There were no issues connecting the device. The range at which the Go was capable of syncing was not long, but long enough to be convenient. The ideal scenario for syncing is when the phone is in your hand or pocket, which is likely a common scenario. Following the update to iOS 10, the range was left mostly unaffected. Initially the range slipped slightly, but recovered after another update from Apple. This was not the only device affected by a drop in range during this period. Because of the decision to use an E Ink display (detailed in Design), the Battery Life is beyond acceptable. Because of the E Ink display, the Go can run on a single button cell battery for up to 9 months. That is in comparison to other devices with LCD screens that require daily charging. We have not had the device for the full 9 month battery life, but it has been in use for several months without issue. In testing the battery on a meter, it still shows a nearly full battery. The Go does not require very much interaction, which means there is very little learning to be done. Once the device is paired with your phone, there is not much you need to do to make it function. The only things to know are about how to read the display. The inner circle, shown in the photo as a person walking, shows where you are in your step goal. The person indicates you have not reached your goal, and changes to a star when you have accomplished it. The ring on the outside of the display shows the percentage of goal reached. The inner ring, which is blank in the image, shows how many times you have completed your goal today. By pressing the display, it switches to a clock instead. The Withings app is mostly straight-forward. For the most part, it is a consumption app, which displays the data collected by the Go, as well as other Withings devices. When paired only with the Go, it will show you your daily step and sleep goals and whether you hit them. From there you can also enter external data, like weight, activity and heart rate. The only slightly odd aspect of the app is the option to add food, which actually does not take place within the app itself, but instead within a partner app. Once you get past this one idiosyncrasy, the experience is very pleasant and easy to learn. After wearing the Go daily for several months, a few comfort issues have become obvious. First, the material that the strap is made out of is not exactly smooth. On a warmer day, having something on your wrist can cause additional sweating and the texture of the strap can cause a bit of chaffing. On a few occasions, my wrist would end up with a red ring around it, but luckily it never hurt and would go away within a few days. Another issue that appeared, only after removing the battery once, involves the battery cover on the back of main electronic. Because of the style of battery cover, the process of removing it is likely to cause a little damage, which can then result in irritating scratches and blisters on your wrist. This type of battery cover is more designed to be used on something like a highway toll transceiver, where the damage is not in contact with your skin and therefore far less important. At first glance, it would appear that the Build Quality is just fine, but when you look under the hood, you might change your opinion. The material used in the strap is wrong on a number of levels. First is the Comfort issue raised earlier - the texture can easily cause skin irritation when you sweat. If the strap were properly smooth, it would be less likely to cause irritation. Second, the strap stains very easily. After only a couple of months of wear, the once bright yellow strap is now a wide variety of shades of dirty yellow, which no amount of cleaning has been able to correct. It makes the device look cheap, instead of like a high-quality wearable. The electronic itself also has build quality issues. As mentioned in the Comfort section, the quality of the plastic and the design of the battery cover come together to cause another skin irritation issue. Once it has been opened once, the plastic stretches, causing uneven edges which scratch a lot. As I write this, I am dealing with a spot on the top of my wrist that was once a small blister caused by this build quality issue. Unfortunately, the plastic quality also leads to gaps around the battery cover. This creates another possible point of friction, though it is mostly covered by the strap. The gap around battery cover, as well as the gap used for opening the cover, both accumulate stuff from the skin, especially when worn for exercising. In addition to the strap discoloring, so does the electronic itself. It is also a bit of a sanitary issue, requiring deep cleaning on a regular basis. The things that the Go is designed to do, it does well. The screen and the clock feature are easy to read, the step counter is fairly intuitive and the battery lasts an extended period of time. The ability to switch the Go from watch mode to pedometer mode is a welcomed addition. Even the companion app functions as well, if not better, than many of the others in the market. The only real issue that we noticed was that the step readings reported by the Go sometimes differ greatly from other trackers worn during the same period. Usually the Go reported similar readings to other trackers, but occasionally it would report 10% or more steps than others. This suggests that perhaps the tracking mechanism is too sensitive, often counting typing motions as steps. While the Build Quality of the Go leaves a lot to be desired, the device itself is incredibly light. 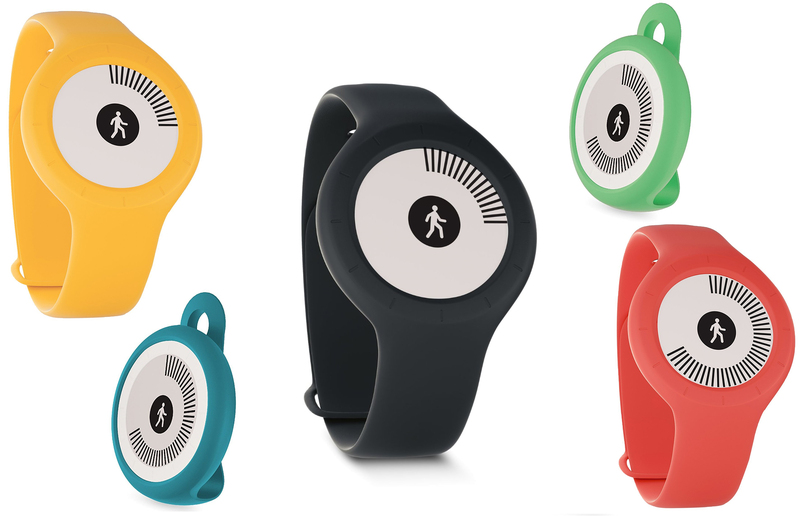 In comparison to some other fitness trackers and smart bands, the Go feels almost non-existent. The weight, or lack thereof, adds to the Comfort of wearing it, whether as a watch or pedometer. The size of the screen is large enough to be easily read, yet small enough to not be heavy or tacky. The Withings app, which is required for operation, is only available for iOS and Android. Other companies in the category have begun to embrace the Windows platform, including the biggest competitor Fitbit, but Withings is currently not available for the platform. Some 3rd party developers have built unofficial apps that interact with Withings data, indicating that there is a demand for Windows support. What adds to the surprise is that Withings is owned by Nokia, one of the largest hardware and software partners for Windows. Configuring the Go was fairly easy. First, choose how you will be using it: pedometer or watch, and put the puck into the appropriate holder. Next, download the app on the device you plan to use it with. Once the app is downloaded, you simply follow the on-screen prompts and the Go is installed and ready to go. The only device interaction you will need is to press the screen once to put it into pairing mode. Once paired, the Go and app will sync, though it should have no data being a new device.